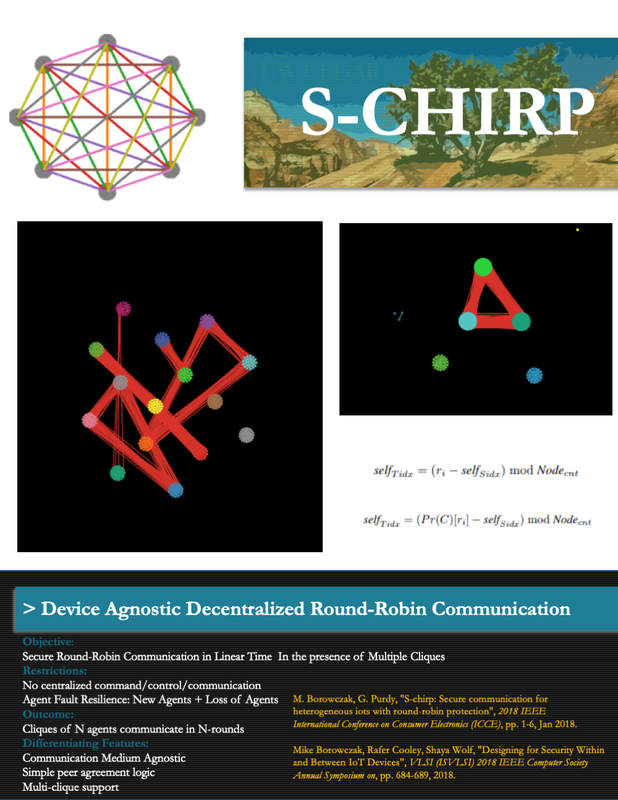 S-CHIRP focuses on lightweight devices that would constitute a mesh or swarm Peer-to-Peer (P2P) network. This includes unmanned aerial vehicle (UAV) swarm networks, blockchain computational nodes, sensor networks, ingestible biomedical sensors, smart home networks, file sharing structures, electric smart meter systems, field communication networks, and similar platforms. With enhanced security and the absence of third party interests, decentralized networks are gaining traction among users who are not willing to trade privacy for convenience. EVO-SCHIRP is an extension of S-CHIRP which uses evolutionary algorithms to attempt to generate a communication protocol similar to S-CHIRP. EVO-SCHIRP uses compositional pattern-producing networks to generate repeating patterns of node communication sequences in attempts to solve communication interferences in environments containing multiple separate grouping of agents.